*We are reliant on a criminal justice system that is too punitive, misogynistic, violent and racist to keep us safe from gender-based violence. Let’s talk! 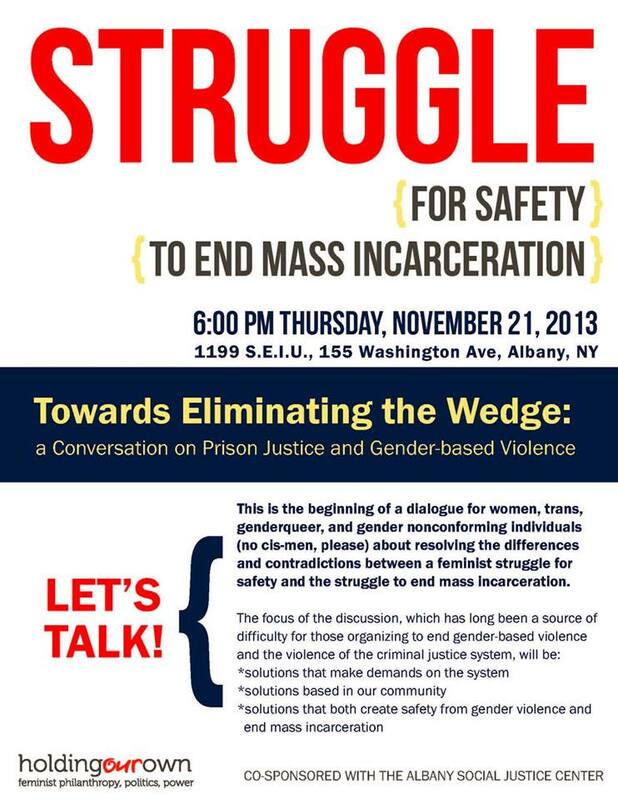 This is the beginning of a dialogue for women, trans, genderqueer and gender nonconforming individuals (no cis-men, please) about resolving the differences and contradictions between a feminist struggle for safety and the struggle to end mass incarceration. This entry was posted in Activism, Local Feminists, Political Education and tagged activism, feminist events, gender violence, holding our own, mass incarceration, prison justice, sexual assault, she breathes. Bookmark the permalink. ← Fabulous Feminists 2013 Awards Bash–Tickets Now Available!